Cassava Fufu is the most traditional Nigerian fufu meal. Click here for how to extract cassava fufu from cassava tubers the traditional way. 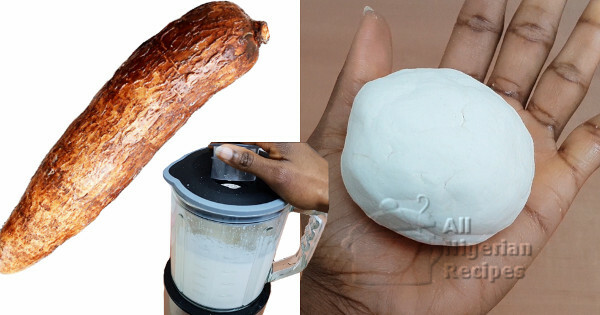 For how to make Cassavav Fufu in a blender, keep reading. Please note that the Cassava Fufu detailed on this page does NOT smell and you do NOT need to pound it in a mortar. Can we really call it Cassava Fufu? The jury is out on that. LOL. Cassava tubers (Yuca) are cultivated in Africa and South America. They can be purchased from African food shops all over the world. Water is used for blending the cassava tubers and when separating the cassava fufu from the cassava starch. Blender: any blender with at 500W is ok for this. See the video below for other utensils I may have forgotton to mention. Peel the cassava tuber following the natural peel (see video below). Rinse thoroughly and cut into small pieces or grate it. Put in a blender and blend into a smooth puree with cool water. Sieve with a chiffon cloth to remove the very fine cassava starch. Rinse with clean water as you sieve till all the starch has been washed off the chaff. The chaff left in the chiffon cloth is your no-smell Cassava Fufu. The one that passed through the chiffon cloth into the bowl is the Delta Starch which is used to make another swallow meal. Click here for the recipe. Put the Cassava Fufu in a clean dry pot and set on the stove. Turn on the heat to medium and start stirring with a wooden spatula till it heats up. Keep adding drops of water bit by bit and keep stirring till the Cassava Fufu changes from pure white to off white. Add a few more drops of water, cover the pot and leave it to heat up. Once it steams up again all over, mix well with the wooden spatula till smooth. Serve with any Nigerian Soup except pepper soups. Pepper Soups are too watery for Nigerian fufu meals.